Except temple food, onions are integral part of Indian curries. For smooth curries, a traditional technique has been to start with chopped/sliced onions, fry them, puree them before proceeding with the remaining recipe. Atul Kochhar does this often in his recipes. The idea sounds fine until one realizes that frying onions properly takes time and/or a lot of fat – neither of which is desirable for an every day modern cook. Here is an alternate way of dealing with pureed onions in Indian curries that is lighter on oil. It takes a bit of time but you can do it once a week or two and use in multiple recipes. Start with 4 large onions finely pureed with 1 tsp salt. To this optionally add 2 Tbsp yogurt. Take a cooking pan with large cooking surface, place it on medium-low heat and pour the mixture in. Cook it down stirring once every 5-10 minutes, until most of the water has evaporated. This should take about 40-45 minutes. At this point, add 2 Tbsp of canola oil and continue to fry the mixture on low heat for another 15 minutes. Cool and store in air tight container. Use a tablespoon or two in recipes including daal, vegetable sambals and curries. With Indian food being as yummy as it is, it is not surprising that many people cook Indian meals occasionally. But if you are starting out, the spice isle at the local Indian store can be hugely confusing. 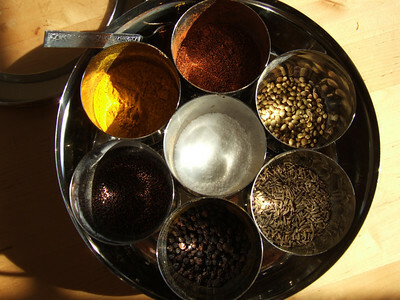 There are at least fifty different spices and hundreds of variations with powders and mixes. Fortunately, a well chosen few will get you most of the way.